From The Era - Wednesday 14 May 1930. 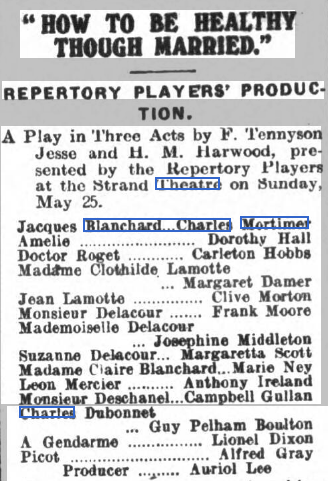 Charles Mortimer played Jacques Blanchard in "How to Be Healthy Though Married", at the Strand, London, on 25 May, 1930. The play is about a wife, who having failed to poison her husband, becomes devoted to him. The Stage assumed it was a spoof! It was produced by Auriol Lee. From The Era of 28 May, 1930. There are two very amusing ideal in this comedy, but the play as a whole lacks the usual adroitness of most of Mr. Harwood’s work. The second act is extremely good, or perhaps it seemed better than it was, it followed one of the dullest and untidiest first acts ever written by a reputable dramatist. Why drag in that tedious dinner party and several totally unnecessary people who play the boring letter game? The play could easily have started with the scene in the office of the Procureur General, where Madame Claire Blanchard is accused of an attempt to poison her elderly husband. The story is really People Like Us inverted. Claire, young and beautiful and highly romantic, is in love with her husband’s Paris representitive - the scene is laid in a small provincial town —and induces her lover to send her packets of arsenic through the posto restante. The letter is discovered and handed to the police and, as most of us suspected, the white powders are found to be bicarbonate of soda, which have the effect of curing the husband’s dyspepsia. Leon Mercier is cleverly drawn. He is a bright young cad with a sense of humour, and a trifle tired of Claire’s passionate caresses. His hilarious confession is good fun, and Claire is dismissed by the dapper Procureur General with a warning. Nothing will be revealed if she will go back and cherish the man she tried to murder. What a good one act play it would have made ! The last act continues the tale somewhat disjointedly. Blanchard is now in process of being killed by kindness! The baby and the cradle may be regarded as symbolical. The doctor orders a six-months rest from married life and eventually it is the Procureur who is called in to enforce the remedy. He succeeds —and there is more than a prospect that Claire will later find consolation in his arms. It is difficult to believe that "How to be Healthy though Married" is not an adaptation from the French, but the authors have done the next best thing and pretended it all took place in France. Some of the dialogue is excellent, and there are some very witty passages. 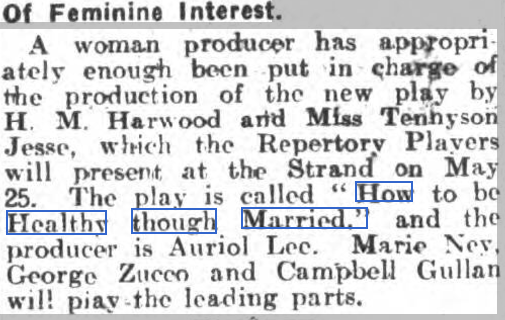 Perhaps the wittiest idea was to engage Miss Marie Ney, who played the wife in ""People Hike Us,” for Claire. She is always first-rate, and she kept the character on the border-line of farce even in the exhibition of rage in the second act. Mr. Campbell Gullan’s splendidly incisive Procureur General and Mr. Anthony Ireland’s study of the lover were the other outstanding features of the performance. 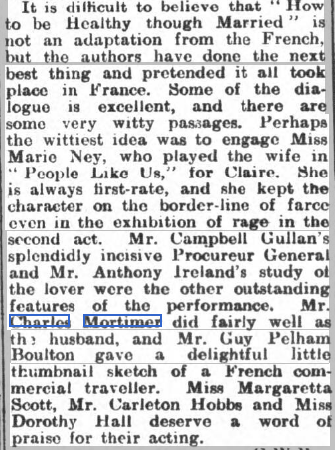 Mr. Charles Mortimer did fairly well as the husband, and Mr. Guy Pelham Boulton gave a delightful little thumbnail sketch as a French commercial traveller. Miss Margaretta Scott, Mr. Carleton Hobbs and Miss Dorothy Hall deserve a word of praise for their acting.